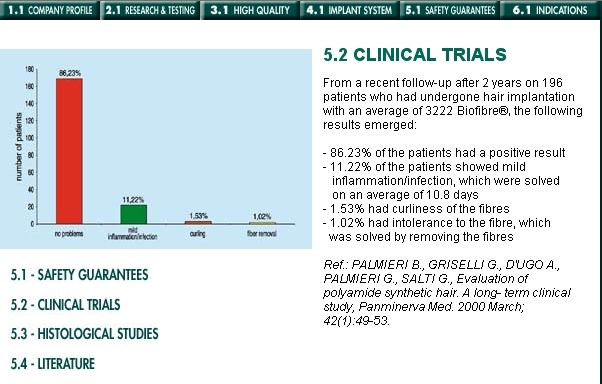 The Biofibre hair implant system (produced by Medicap s.r.l.) is a revolutionary artificial hair that is implanted into the scalp as a replacement for natural hair. The patented system is provided by several leading clinics around the world. Dr Hajduk and the staff at GHO clinic are specially trained and certified to provide the system. » are specially trained and certified to provide the system. The Praguemakeover clinic is nothing to do with Dr Gho.They are using his old method,which he lost his rights to,I think when he had his financial problems. GHO Clinic is no longer owned or run by Dr. Coen Gho himself. There was a reorganization a few years. Dr. Gho started his own clinic (The Hair Science Institute) while the investors retained the name GHO Clinic. » Has anyone tried Biofibre? fastforward good question - as anyone? » » Has anyone tried Biofibre? » fastforward good question - as anyone? believe me when i tell you STAY AWAY. These synthic fibers have been around a long time and can really damage your scalp, infections, scarring etc. I don’t beleive they are allowed in the U.S. Artificial hair is a product sold in Asia and limited countries in the western world. It has been banned by most countries because it must be surgically implanted with a special sewing needle. This would be a procedure that would need FDA approval and it has not been approved as safe in the United States. Many patients’ bodies will actually reject the artifical hair as it would any foreign body once it is implanted into the scalp. I have seen some patients with wonderful results. It gives ‘instant hair’ and as a result it is a big selling point in countries where it is allowed, BUT I have also seen patients that have developed massive scalp infections from these ‘artificial hairs’. There is a trade off and safety is sacrificed in exchange for short term benefits. Biofibre is one of the sites for artificial hair. Reading it might give you more information, but I would strongly caution your pursuit of this as a solution for your hair loss. Just for discussion purposes. I am not endorsing this. I haven’t yet met anyone who had this procedure done. » anyone who had this procedure done. Even they admit there is risk of infection. 11% is very high, more than 1 out of 10 will get infection. I wonder how much they charge for a scam like this. Dr Gho is no longer associated with the Gho Clinic! A group of investors bought rights to his old clinic name and his old technologies quite a few years ago. Gho has a new clinic with a different name and is involved in newer technologies. The before and after pictures on their website is a joke. I know they sell Biofibre in Italy et France. » » are specially trained and certified to provide the system. » I know they sell Biofibre in Italy et France. That is good to hear. Too bad for Bosley. » Science Institute) while the investors retained the name GHO Clinic. The Gho clinic itself went bankrupt if I am not mistaken last year.